BEARD Vape Co - The Salty One Strawberry 30mLAvailable in 30mg and 50mg in 30mL bottles.This flavor .. BEARD Vape Co - The Salty One Apple Berry 30mLAvailable in 30mg and 50mg in 30mL bottles.This flavor.. BEARD Vape Co - The Salty One Apple 30mLAvailable in 30mg and 50mg in 30mL bottles.This flavor is a .. Beard - No. 99 60mLLem-Raz CookieTart lemons and raspberry baked to perfectionVG/PG 60/40Availa.. BEARD Vape Co - The One Apple 100mLThe latest, (arguably) greatest addition to The One family is fin.. BEARD Vape Co - The One Blueberry 100mLBlueberry Cereal Donut MilkVG/PG: 70/30Available in 0mg, 3mg,.. Beard - No. 00 60mLSweet tobaccoccino.Available in 60mL bottles in 0mg, 3mg, and 6mg nicotine levels.. Beard - No. 71 60mLSweet & sour sugar peach.Available in 60mL bottles in 0mg, 3mg, and 6mg nicot.. Beard - No. 32 60mLA delicious cinnamon funnel cake.Available in 60mL bottles in 0mg, 3mg, and 6mg n.. Beard - No. 05 60mLNew York style cheesecake with strawberries on top.Available in 60mL bottles in 0.. Beard - No. 24 60mLSalted caramel malt.Available in 60mL bottles in 0mg, 3mg, and 6mg nicotine level.. 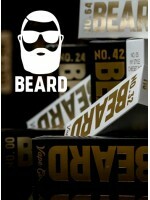 BEARD Salt 30mL - NO. 71Now, Beard introduces an amazing all new line of nicotine salt e-liquid prod.. BEARD Salt 30mL - NO. 05Now, Beard introduces an amazing all new line of nicotine salt e-liquid prod.. BEARD Salt 30mL - NO. 42Now, Beard introduces an amazing all new line of nicotine salt e-liquid prod.. BEARD Salt 30mL - NO. 32Now, Beard introduces an amazing all new line of nicotine salt e-liquid prod.. BEARD Salt 30mL - NO. 00Now, Beard introduces an amazing all new line of nicotine salt e-liquid prod.. BEARD Vape Co - The One Lemon 100mLThe One Lemon is a mouth-watering blend of deliciously moist yell.. BEARD Vape Co - The One 100mLTry our new mouth-watering flavor filled with doughnuts, strawberries, ..